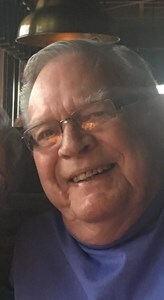 David Henry Rice, 84, of Louisville, Kentucky, passed away on Saturday, February 9, 2019. David was a 32 Degree Master Mason, since 1969, at Suburban Lodge,a member of Scottish Rite, a United States Navy Veteran, a friend of Bill's for 24 years, and a member and active volunteer of Southeast Christian Church. He was born on September 25, 1934 in Powderly, Kentucky to Lonnie and Ruth Rice. He is preceded in death by his parents, daughter, Debbie Evans, and Son Danny Rice. David is survived by the love of his life for 37 years, Betty M. Rice, Son, Michael (Melinda) Rice, Daughter, Laura (Thomas) Klarer, Sister, Naomi (Robert) Atherton, and 7 Grandchildren. The family requests that contributions in David’s memory be made to Southeast Christian Church. Add your memories to the guest book of David Rice. My daddy was the best dad ever. I'm glad he held on long enough for me to be there with him as he left this world to join our loving Lord. Our prayers are with the love of his life ( Betty ) and my extended family. I am so grateful that he had them to love and care for him throughout his lifetime and up until his departure.Until we meet again in Glory daddy.. I love you!! My uncle Dave was such a handsome man and swept my Aunt Betty off her feet! They were the loves of each others lives! You could tell that the moment you were in their presence. He will be greatly missed by all. Until we meet again Uncle Dave. Love you! Sure did enjoy your friendship David. Your friend , Rick.